For the ABC-TV series, see Wandjina! Dreamtime stories say the Wandjina created the landscape and its inhabitants, and continue to have influence over both. When the spirits found the place they would die, they painted their images on cave walls and entered a nearby waterhole. These paintings were then refreshed by Aborigines as a method of regenerating life force. The Wandjina can punish those who break the law with floods, lightning and cyclones. The broad-stroke artwork of the Wandjina rock art dates around 3800–4000 years ago. The emergence of this art style follows the end of a millennium-long drought that gave way to a wetter climate characterised by regular monsoons. 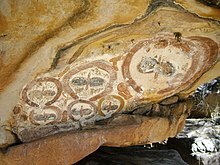 The Wandjina paintings have common colors of black, red and yellow on a white background. The spirits are depicted alone or in groups, vertically or horizontally depending on the dimensions of the rock, and are sometimes depicted with figures and objects like the Rainbow Serpent or yams. Common composition is with large upper bodies and heads that show eyes and nose, but typically no mouth. Two explanations have been given for this: they are so powerful they do not require speech and if they had mouths, the rain would never cease. Around the heads of Wandjina are lines or blocks of color, depicting lighting coming out of transparent helmets. Today, the paintings are still believed to possess these powers and therefore are to be approached and treated respectfully. Each site and painting has a name. Indigenous people of the Mowanjum Community repaint the images to ensure the continuity of the Wandjina's presence. Annual repainting in December or January also ensures the arrival of the monsoon rains, according to Mowanjum belief. Repainting has occurred so often that at one site the paint is over 40 layers deep. The painting style has evolved during this process: more recent figures are stockier and some now possess eyelashes. In late 1960's and early 1970's several Mowanjum artists depicted traditional Wandjina on pieces of string bark. These artworks were sold mainly through the mission at Kalumbaru. Some of the important artists from this region include Alec Mingelmanganu, Charlie Numbelmoore and Jack Karedada. These artworks are now in major museum collections around the world. In 2007, graffiti depictions of Wandjina appeared in Perth, Western Australia. Styles ranged from stencil-work to a spray painted Wandjina driving a pink car. Using Flickr and blogs, several people engaged in 'Wandjina watching', documenting the Wandjina graffiti they found. These 'wandering Wandjina' angered and upset some Indigenous people who said that only certain of their people are permitted to depict the Wandjina, without saying who these people are. A short film, Who Paintin' Dis Wandjina, discussed the Aboriginal reaction. Images of the Wandjina are displayed on the walls of the Ringwood Magistrates Court in Victoria; these are referenced as produced the National Gallery of Victoria. ^ Yorro Yorro: everything standing up alive, (1993), Mowaljarlai, D, and Malnic, J., Magabala Books, pp137-139. ^ a b Flood, Josephine (1997). Rock Art of the Dreamtime. ^ McGown, Hamish; Marx, Samuel; Moss, Patrick; Hammond, Andrew (28 November 2012). "Evidence of ENSO mega-drought triggered collapse of prehistory Aboriginal society in northwest Australia". Geographical Research Letters. 39 (22): 5. doi:10.1029/2012GL053916. ^ Flood, Josephine (1997). Rock Art of the Dreamtime. ^ curator), Ryan, Judith (Museum (1993). Images of power : aboriginal art of the Kimberley. Akerman, Kim., National Gallery of Victoria. Melbourne, Vic. : National Gallery of Victoria. ISBN 978-0724101603. OCLC 29776440. ^ "Alec Mingelmanganu wandjina | wondjina | sell Alec Mingelmanganu". Aboriginal Bark Paintings. 2017-09-18. Retrieved 2018-11-13. ^ "Charlie Numbelmoore | Charlie Numbulbor | sell Charlie Numbelmoore". Aboriginal Bark Paintings. 2017-09-18. Retrieved 2018-11-13. ^ "Jack Karedada wandjina painting | wondjina | Sell Jack Karedada". Aboriginal Bark Paintings. 2017-09-18. Retrieved 2018-11-13. ^ Spirits, Jens Korff, Creative. "Australian Aboriginal movies, films & Indigenous DVDs". This page was last edited on 30 January 2019, at 08:44 (UTC).